While they sometimes go underestimated as an option for carrying your daily essentials (except by cyclists), we think a sleek backpack is a great way to tote your gear around whether you’re on a bike or not. Mission Workshop, based in San Francisco, makes high-quality bags inspired by and crafted for cyclists, but suitable for travel and everyday use. The Mission Workshop Sanction Rucksack ($179) is the smallest pack that they offer, and it’s a perfect example of a bag that is versatile enough to be used on your bike, during your non-bike commute to the office, or on a seven-mile hike in the woods. We got our hands on a sleek gray version of the pack and gave it a dry run so we could give you our impressions. The Sanction Rucksack is the smallest of the Mission Workshop family, but still offers users 1,000 cubic inches of storage space in a durable, waterproof package. Built with waterproof fabrics that are military spec construction, the Sanction is meant to last a lifetime, no matter what kind of weather you get yourself into. The small pack features an internal frame sheet, multiple waterproof pockets, urethane-coated zippers, and a large zippered pocket perfectly-sized for your 15-inch MacBook Pro. Each bag is made right here in the States and comes with a lifetime warranty, guaranteeing that the materials on your bag never give out. The top of the bag has a flap closure that buckles down, and a small external pocket that’s perfect for your phone or other things you want easily accessible. Underneath the flap, the bag has one larger and one smaller waterproof zippered pocket, as well as a good-sized open pocket for daily essentials. The main compartment has enough room for an extra sweatshirt and other basic items, while the zippered laptop pocket fits nicely against your back for good weight distribution. The underside of the top flap also has a zippered pocket for papers or other smaller items. The backside of the pack is flat but has good padding for comfort. As far as our own impressions go, we will first say that this is one good-looking backpack. The design is sleek, modern, and urban, but it looks nice enough to tote into the office with you, even if you work in a suit-and-tie environment. 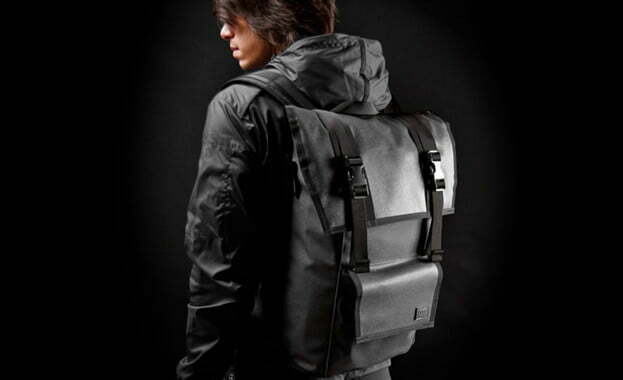 We liked the looks of our gray version, but the other colors offered by Mission Workshop all look muted and versatile. The size of the pack is also great for versatility. If you’re a serious bike courier or need to carry a week’s worth of junk on your back, this isn’t the bag for you. But if you want to carry a day’s worth of essentials, no matter the situation, the Sanction is the perfect size. We like the amount of pockets and the variation in size, not to mention the fact that almost all of them are sealed waterproof thanks to the high-tech zippers. All of the fabrics used in the construction of the bag seem hefty and durable, which is one of our most important factors for this kind of bag. If this bag is in the right size range for what you might need on a daily basis, we would definitely recommend the Sanction Rucksack. We were impressed with everything from its looks to its functionality and versatility. In our humble opinion, you couldn’t ask for too much more in a small-sized pack that transitions from cycling to everyday use.